The Belum State Park, or officially Royal Belum State Park, is located within the immense Belum-Temengor Forest Reserve in Perak. The park is completely surrounded by the forest reserve, which is older than 130 million years old and the untouched forest is home to a large variety of flora and fauna. The main attraction of the park is really the green surrounding, fresh air and relaxing atmosphere, offering visitors a sense of tranquility and awe. 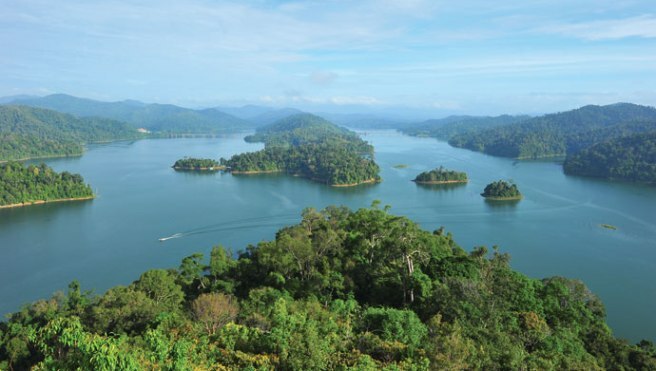 Located within the park is a man-made lake, Lake Temenggor, the second largest in Malaysia that adds to the beauty of the park. Apart from being surrounded by the serenity of the forest, visitors have plenty of activities to participate in. Visitors can trek through the largely unexplored jungle and go bird watch. The forest is the only one where visitors can see all 10 hornbill species in Malaysia. Visitors can also relax and dip into the cooling waterfalls, or take a boat cruise through the jungle. Visitors will also have a chance to watch animals at a close distance as they come to salt licks located at Bumbun within the park. The park is home to 14 of the world’s most endangered mammals and there are very little places elsewhere where visitors get to see such large concentration of endangered animals. Inhabiting some parts of the forest are the indigenous people called the Jahai and visitors can pay them a visit to learn more about their culture and living. The chance to visit a forest reserve that is over 130 million years old and be in touch with such pristine environment must not be missed. Visitors can reach Royal Belum State Park by rented car or other public transportation. Driving from Kuala Lumpur takes about 5 hours. First, take the North-South Expressway to Ipoh before taking exit 143 off Kuala Kangsar. Then, follow the road signs that show the way to Kuala Kangsar, followed by Sauk, Lenggong and finally Gerik. The turning into Gerik leads to the East-West Expressway. Follow this expressway and signs that lead to Royal Belum State Park. Visitors will come to Pulau Banding Jetty and take a boat ride that leads to the park. Alternatively, visitors can take a bus from Kuala Lumpur (or any other city) to Gerik bus station. From there, visitors can take a taxi to Pulau Banding Jetty, which is just 40 kilometres away. Entry to Royal Belum State Park requires a pass that must be obtained before arrival. Each pass costs RM 10.